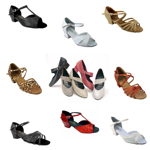 Featuring dance shoes from Tic-Tac-Toes Dance Shoes and Very Fine Dance Sport Shoes. These dance shoes are ideal for West Coast Swing. We feature open toe, sandals and close toe designs with a wide base 1.5" or 1.6" heel.